The Austin-Healey 100/4 BN2 sports car was replaced by the 100/6 BN4, in October 1956, after a successful run. The BN4 was initially introduced powered by a BMC C-Series, 2639 cc, 6-cylinder, overhead valve engine, combined with a two port cylinder head developing 102 bhp, and was offered as a 2+2 version. In the latter part of 1957, the original head, with a two port inlet manifold, was replaced with a six port manifold, larger SU carburettors, larger valves, and increased compression ratio. As a result, the output of the BN4 sports car was increased to 117 bhp, with a corresponding increase in acceleration and top speed. In June 1958, the 100/6 BN4 2+2 variant was retained, but a pure two seater version was added, and was designated the 100/6 BN6 sports car. Apart from the change in seating arrangements, the two variants were very similar. The inclusion of a two seater version was seen by many as a return to the Healey 100's original concept. The 2+2 variant was initially introduced to expand the market for the 100/6 and so attract new customers. In 1959, the final year of production of both models, 4,150 units of the BN6 were built compared with 3,912 units of the BN4. In fact, the introduction of the BN6 was as a result of requests from dealers to satisfy demand for a two seater. The BN6 was initially introduced in March 1958, at which point production of the BN4 was halted in order to clear excess components at the Jensen factory. However, in the September, production of both variants was resumed. Although it was only a two seater, the BN6 still used the longer wheelbase of the BN4. Also, exterior door handles were added to the BN6, and these were applied to subsequent 2+2 models. Another feature of this variant was the addition of two piece Perspex sliding side screens, in which the rear moveable section offered better ventilation. However, there was a tendency for it to slide open by itself, which could be annoying. As a rally car, the six port C-Series engine was both flexible and powerful and, in the main, it was quite reliable. Furthermore, the body structure of the 100/6 was particularly robust. However, the car tended to exhibit heavy steering, and therefore was tiring to drive. It also needed careful handling in the wet or on slippery surfaces, and was prone to oversteer. Another shortcoming was that the cabin would get too hot in warm weather whilst, on the other hand, the heater was inefficient. In June 1959, the 100/6 BN6 was replaced by the Austin-Healey 3000 sports car. The 100/6 was available in both Standard and De Luxe models. The Standard version was equipped with disc wheels, no overdrive, and no heater. On the other hand, the De Luxe version included wirer wheels, the two tone paint system, an overdrive unit, and a heater. The optional extras included a detachable hardtop, a fresh air heater combined with a demister, and wire spoke knock off hubs. 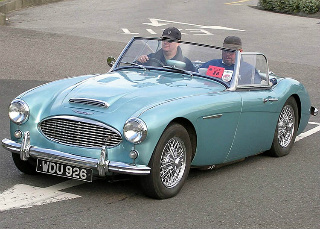 The Austin-Healey 100 sports car first appeared in 1953 as the 100/4 BN1 and then, in 1955, the 100/4 BN2 was introduced, both as two seater models. Then, in 1956, the 100/6 was launched as the 2+2 BN4 variant. Finally, in 1958, the two seater 100/6 BN6 was introduced. 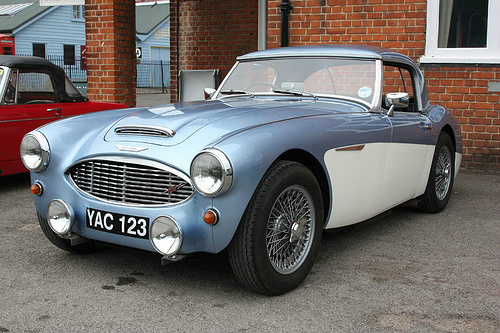 However, the BN3 was, in fact, the original Austin-Healey 100 with a six cylinder engine. There were at least two BN3's built at Donald Healey's Warwick factory as prototypes to assess the 6-cylinder engine in the Austin-Healey chassis. Designated the BN3/1 sports car, one of these cars used a BN1 chassis to which was added the C-Series, 6-cylinder engine, coupled with a four speed gearbox. In order to fit the engine, the radiator had to be positioned further forward. Subsequently, it was decided to offer the car as a four seater 2+2, and so BN3/1 was transferred to the Jensen factory for the necessary modifications. The car was finally reassembled at Warwick with the new grill and bonnet scoop. However, the first production models of the BN3 were actually designated the 100/6 BN4. Of further interest was the fact that there was even a BN5, which was a four seater prototype, used in the 1957 Mille Miglia, incorporating disc brakes and a detuned engine. The Mille Miglia was a famous Italian road race for sports cars. The course covered 1,000 miles of racing on public roads, from the town of Brescia to Rome, together with the return trip. The first race was held in 1927, and the object was to drive as fast as possible. The cars set off at intervals of one minute, with the slowest first. In 1957, Austin-Healey entered the prototype 100/6 BN5 sports car into that years Mille Miglia, fitted with the new six port head, larger HD6 carburettors, a standard 2639 cc engine, and four wheel disc brakes. The car finished in first place in its class based on price, at an average speed of 76 mph. Overall, in a field of 350 cars, the BN5 ended in 37th position, and marked the beginning of Austin Healey's entry into road racing and rallying. Sadly, this was the last Mille Miglia race due to a serious crash in which a Ferrari left the road and into the spectators. A 1958-59 Austin Healey 100/6 BN6 would command anything between £30,000/$50,000 and £50,000/$80,000 for this two seater variant.